She was born in Porto Alegre and graduated in Journalism from Universidade Federal do Rio Grande do Sul (1980). She’s the director of Prana Films and worked as reporter on TV Guaíba (1981) and RBS-TV (1984). Began his film career in the early 1980s, filming in Super-8. As a producer, she worked on the feature films “Inverno” (Winter, 1983), “Tolerância” (Tolerance, 2000), “Sal de Prata” (Silver Salt, 2005), “Menos que Nada” (Less Than Nothing, 2011) and “Bio” (2018), all directed by Carlos Gerbase; “Houve Uma Vez Dois Verões” (Two Summers, 2002), “O Homem que Copiava” (The Man Who Copied, 2003), “Meu Tio Matou um Cara” (My Uncle Killed a Guy, 2004) and “Saneamento Básico – O Filme” (Basic Sanitation – The Movie, 2007), by Jorge Furtado; “Antes que o Mundo Acabe” (Before the World Ends, 2008), by Ana Luiza Azevedo; “Yonlu” (2017), by Hique Montanari; “Legalidade” (Legality, 2019), by Zeca Britto, and “Mudança” (Change, 2019), by Fabiano de Souza. 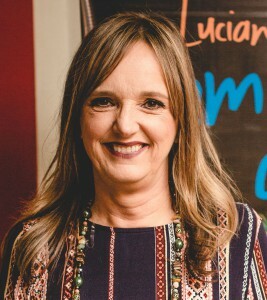 She also produced more than 30 short films between 1986 and 2018, made by directors such as Carlos Gerbase, Jorge Furtado, Ana Luiza Azevedo, Liliana Sulzbach and Augusto Canani, among others. In television, Luciana worked as a producer in the miniseries “A Roleta” (1988), “Luna Caliente” (1991), “Incidente em Antares” (Incident in Antares, 1994), “A Comédia da Vida Privada” (Comedy of Private Life, 1997), “Histórias do Bom Fim” (1997) and “O Futuro da Terra” (1997). She wrote the books “Um Spa na Índia / A Spa in India” (2007), “Três Cidades Perto do Céu / Three Cities Near the Sky” (2011) and “Bem Longe de Casa / Far Away from Home” (2018). Since 2001, Luciana is the director of movie theater Cine Santander Cultural, where she develops the educational project First Film.